Editors Note: There are three images associated with this press release. (TSX VENTURE:BBI) Blackbird Energy Inc. ("Blackbird" or the "Company") is pleased to announce a 1,002% increase in proved plus probable reserves ("2P") before tax net present value to $455 million, discounted at 10% ("NPV10%"), and a before tax risked best estimate contingent resources NPV10% ("2C") value of $437 million. Blackbird has now booked 11.9% of its net Pipestone / Elmworth acreage on a 2P basis and 21.2% of its net Pipestone / Elmworth Montney acreage on a contingent resources basis. Montney acreage at Pipestone / Elmworth through a cost-effective land acquisition strategy. This strategy has resulted in Blackbird holding an aggregate Pipestone / Elmworth Montney land position of 116 gross (100.9 net) sections as at March 27, 2017.
commenced production from four Montney wells in January, 2017, with its fifth well expected to be tied-in during the first half of 2017 and its sixth well expected to be tied-in upon the construction of an eastern pipeline gathering system. million, entered into a non-binding nomination for an additional 90 mmcf/d of natural gas processing by 2021, and is implementing a 12 well development and delineation program over the next twelve months. As a result of the historical developments discussed above, Blackbird engaged its independent reserves evaluators, McDaniel & Associates Consultants Ltd. ("McDaniel"), to perform reserves and contingent resources evaluations effective March 1, 2017 (the "Evaluations"). McDaniel January 1, 2017 price deck (the "Forecasted Prices") and forecasted costs. Elmworth Montney net sections on a 1P basis. This represents 7.9% of Blackbird's net Pipestone / Elmworth Montney acreage. -- Total 2P reserves volumes increased 814% to 59,169 MBOE (46% NGLs). Forecasted Prices and forecasted costs. Elmworth Montney net sections on a 2P basis. This represents 11.9% of Blackbird's net Pipestone / Elmworth Montney acreage. -- Risked 2C volumes increased from nil to 53,818 MBOE. 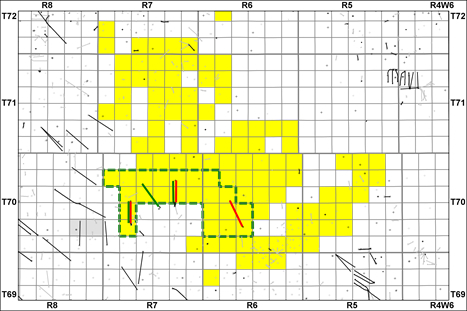 / Elmworth net Montney sections on a contingent resources basis. This represents 21.2% of Blackbird's net Pipestone / Elmworth Montney acreage. in two Montney intervals. In addition to these two intervals, management believes that there are two additional un-booked highly prospective intervals on the majority of its lands. All reserves and contingent resources volumes referenced above are reported on a company gross basis. The following table summarizes the Company's gross reserves and contingent resources volumes by category and the NPV10% as contained in the Evaluations. (2) The Reserve Report contemplates 46 undeveloped 1P drilling locations. 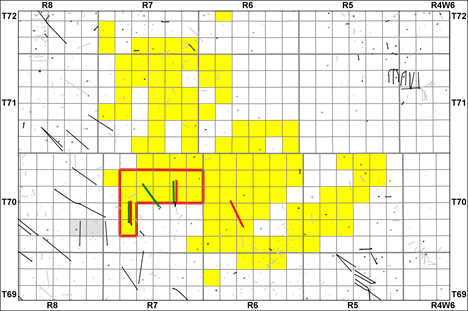 (3) The Reserve Report contemplates 70 undeveloped 2P drilling locations. Evaluations is $6 million. (5) Total undiscounted 2P capital expenditures contemplated in the reserve report amount to $515 million. (6) The Evaluations contemplate an expected ultimate recovery of 801,000 boe per undeveloped location (46% NGLs). (7) Blackbird has a 100% working interest in the lands associated with the reserves and contingent resources. (8) Blackbird expects to recover natural gas and NGLs. (9) See "Advisories and Forward Looking Information" below for a discussion regarding the risks and the level and uncertainty associated with contingent resources. (10) All of the contingent resources discussed above are located at the Company's Pipestone / Elmworth Montney project where ongoing development drilling is already occurring. For an illustration of the location of the contingent resources, see Figure 3. (11) Project maturity subclass development pending is defined as contingent resources where resolution of the final conditions for development is being actively pursued (high chance of development). (12) Contingent resources for Pipestone have been estimated based on the continued drilling in Blackbird's active core asset and the associated pre-development study using established recovery technologies. The estimated cost to bring these contingent resources on commercial production is $562MM and the expected timeline is between 1 and 6 years. The specific contingencies for these resources are corporate commitment, development timing and uncertainty on additional required gas processing and takeaway capacity. Blackbird Energy Inc. is a highly innovative oil and gas exploration and development company focused on the liquids-rich Montney fairway at Pipestone / Elmworth, near Grande Prairie, Alberta. This news release contains certain forward-looking information and statements that involve various risks, uncertainties and other factors. The use of any of the words "anticipate", "continue", "estimate", "expect", "may", "will", "should", "believe", "plans", and similar expressions are intended to identify forward-looking information or statements. In particular, but without limiting the foregoing, this news release contains forward-looking information and statements pertaining to the following: Blackbird's fifth and sixth wells being tied-in during the first half of 2017 and upon the construction of an eastern pipeline gathering system respectively, implementing a 12 well development and delineation program over the next twelve months, the prospectivity of additional unbooked intervals on Blackbird's lands, the drilling of any undeveloped locations, the expected ultimate recovery of Blackbird's wells, the capital costs associated with Blackbird's wells, resolution of the final conditions for development with respect to contingent resources, the estimated cost to bring contingent resources on commercial production and the expected timeline, corporate commitment, development timing and the ability to secure additional required gas processing and takeaway capacity. In addition, references to reserves and resources are deemed to be forward-looking information, as they involve the implied assessment, based on certain estimates and assumptions, that the reserves and resources described exist in the quantities predicted or estimated. With respect to forward-looking information contained in this document, assumptions have been made regarding, among other things: future oil, NGLs and natural gas prices being consistent with current commodity price forecasts (including McDaniel's price forecasts); the Company's continued ability to obtain qualified staff and equipment in a timely and cost-efficient manner; infrastructure and facility design concepts that have been applied by the Company elsewhere in its Pipestone / Elmworth Project may be successfully applied to the properties; the consistency of the regulatory regime and framework governing royalties, taxes and environmental matters in the jurisdictions in which the Company conducts its business and any other jurisdictions in which the Company may conduct its business in the future; the Company's ability to market production of oil, NGLs and natural gas successfully to customers; the Company's future production levels and amount of future capital investment will be consistent with the Company's current development plans and budget; the applicability of new technologies for recovery and production of the Company's reserves and resources may improve capital and operational efficiencies in the future; the recoverability of the Company's reserves and resources; sustained future capital investment by the Company; future cash flows from production; the future sources of funding for the Company's capital program; the Company's future debt levels; geological and engineering estimates in respect of the Company's reserves and resources; the geography of the areas in which the Company is conducting exploration and development activities, and the access, economic, regulatory and physical limitations to which the Company may be subject from time to time; the impact of competition on the Company; and the Company's ability to obtain financing on acceptable terms. Actual results could differ materially from those anticipated in the forward-looking information that is contained herein as a result of the risks and risk factors that are set forth in the Company's annual information form for the year ended July 31, 2016, which is available on SEDAR at www.sedar.com, including, but not limited to: volatility in market prices and demand for oil, NGLs and natural gas and hedging activities related thereto; general economic, business and industry conditions; variance of the Company's actual capital costs, operating costs and economic returns from those anticipated; the ability to find, develop or acquire additional reserves and the availability of the capital or financing necessary to do so on satisfactory terms; risks related to the exploration, development and production of oil and natural gas reserves and resources; negative public perception of oil sands development, oil and natural gas development and transportation, hydraulic fracturing and fossil fuels; actions by governmental authorities, including changes in government regulation, royalties and taxation; potential legislative and regulatory changes; the rescission, or amendment to the conditions of, groundwater licenses of the Company; management of the Company's growth; the ability to successfully identify and make attractive acquisitions, joint ventures or investments, or successfully integrate future acquisitions or businesses; the availability, cost or shortage of rigs, equipment, raw materials, supplies or qualified personnel; adoption or modification of climate change legislation by governments; the absence or loss of key employees; uncertainty associated with estimates of oil, NGLs and natural gas reserves and resources and the variance of such estimates from actual future production; dependence upon compressors, gathering lines, pipelines and other facilities, certain of which the Company does not control; the ability to satisfy obligations under the Company's firm commitment transportation arrangements; the uncertainties related to the Company's identified drilling locations; the high-risk nature of successfully stimulating well productivity and drilling for and producing oil, NGLs and natural gas; operating hazards and uninsured risks; the possibility that the Company's drilling activities may encounter sour gas; execution risks associated with the Company's business plan; failure to acquire or develop replacement reserves; the concentration of the Company's assets in the Pipestone / Elmworth Project area; unforeseen title defects; aboriginal claims; failure to accurately estimate abandonment and reclamation costs; development and exploratory drilling efforts and well operations may not be profitable or achieve the targeted return; horizontal drilling and completion technique risks and failure of drilling results to meet expectations for reserves or production; limited intellectual property protection for operating practices and dependence on employees and contractors; third-party claims regarding the Company's right to use technology and equipment; expiry of certain leases for the undeveloped leasehold acreage in the near future; failure to realize the anticipated benefits of acquisitions or dispositions; failure of properties acquired now or in the future to produce as projected and inability to determine reserve and resource potential, identify liabilities associated with acquired properties or obtain protection from sellers against such liabilities; changes in the application, interpretation and enforcement of applicable laws and regulations; restrictions on drilling intended to protect certain species of wildlife; potential conflicts of interests; actual results differing materially from management estimates and assumptions; seasonality of the Company's activities and the Canadian oil and gas industry; alternatives to and changing demand for petroleum products; extensive competition in the Company's industry; changes in the Company's credit ratings; third party credit risk; dependence upon a limited number of customers; lower oil, NGLs and natural gas prices and higher costs; failure of 2D and 3D seismic data used by the Company to accurately identify the presence of oil and natural gas; risks relating to commodity price hedging instruments; terrorist attacks or armed conflict; cyber security risks, loss of information and computer systems; inability to dispose of non-strategic assets on attractive terms; security deposits required under provincial liability management programs; reassessment by taxing authorities of the Company's prior transactions and filings; variations in foreign exchange rates and interest rates; third-party credit risk including risk associated with counterparties in risk management activities related to commodity prices and foreign exchange rates; sufficiency of insurance policies; potential litigation; variation in future calculations of non-IFRS measures; sufficiency of internal controls; breach of agreements by counterparties and potential enforceability issues in contracts; impact of expansion into new activities on risk exposure; inability of the Company to respond quickly to competitive pressures; and the risks related to the common shares that are publicly traded and the Company's senior notes and other indebtedness. Estimates of the Company's reserves and contingent resources and the net present value of future net revenue attributable to the Company's reserves and contingent resources as at March 1, 2017, are based upon the reports that were prepared by McDaniel, dated March 24, 2017. The estimates of reserves and contingent resources provided in this document are estimates only and there is no guarantee that the estimated reserves or contingent resources will be recovered. Actual reserves and contingent resources may be greater than or less than the estimates provided in this in this document, and the differences may be material. The estimates of reserves or contingent resources and future net revenue for individual properties may not reflect the same confidence level as estimates of reserves and future net revenue for all properties, due to the effects of aggregation. Estimates of net present value of future net revenue attributable to the Company's reserves and contingent resources do not represent the fair market value of the Company's reserves and contingent resources and there is uncertainty that the net present value of future net revenue will be realized. There is no assurance that the forecast price and cost assumptions applied by McDaniel in evaluating Blackbird's reserves, contingent resources and prospective resources will be attained and variances could be material. There is uncertainty that it will be commercially viable to produce any portion of the contingent resources that are described herein. Blackbird has adopted the standard of 6 Mcf:1 bbl when converting natural gas to boes. Condensate and other NGLs are converted to boes at a ratio of 1 bbl:1 bbl. Boes may be misleading, particularly if used in isolation. A boe conversion ratio of 6 Mcf:1 bbl is based roughly on an energy equivalency conversion method primarily applicable at the burner tip and does not represent a value equivalency at the Company's sales point. Given the value ratio based on the current price of oil as compared to natural gas is significantly different from the energy equivalency of 6 Mcf: 1 bbl, utilizing a conversion ratio at 6 Mcf: 1 bbl may be misleading as an indication of value. Finding, development and acquisition costs have been calculated by the Company as the sum of exploration and development capital, plus acquisition capital, plus changes in future development costs for the given year, divided by total reserve additions for that year. Finding and development costs are calculated as the sum of exploration and development costs, plus changes in future development costs (excluding future development capital associated with acquisitions and dispositions), divided by reserve additions (excluding reserves added via acquisitions). Finding and development both including and excluding acquisitions are presented since acquisition and disposition activity can result in reserve replacement metrics that are not indicative of the long-term cost structure that is expected from the Company's assets. Management utilizes finding and development metrics for its internal measurement. Readers are advised that this information may not be comparable to similarly defined measures presented by other entities and comparisons should not be made between such measures provided by the Company and by other companies without also taking into account any differences in the way that the calculations were prepared. Low estimate contingent resources, defined herein as 1C, is a classification of estimated resources described in the Canadian Oil and Gas Evaluation Handbook, which is considered to be the best estimate of the quantity that will actually be recovered. It is equally likely that the actual quantities recovered will be greater or less than the best estimate. Resources in the best estimate case have a 90% probability that the actual quantities recovered will equal or exceed the estimate. Best estimate contingent resources, herein defined as 2C, is a classification of estimated resources described in the Canadian Oil and Gas Evaluation Handbook, which is considered to be the best estimate of the quantity that will actually be recovered. It is equally likely that the actual quantities recovered will be greater or less than the best estimate. Resources in the best estimate case have a 50% probability that the actual quantities recovered will equal or exceed the estimate. High estimate contingent resources, herein defined as 3C, is a classification of estimated resources described in the Canadian Oil and Gas Evaluation Handbook, which is considered to be the best estimate of the quantity that will actually be recovered. It is equally likely that the actual quantities recovered will be greater or less than the best estimate. Resources in the best estimate case have a 10% probability that the actual quantities recovered will equal or exceed the estimate. Contingent resources are the quantities of petroleum estimated, as of a given date, to be potentially recoverable from known accumulations using established technology or technology under development, but which are not currently considered to be commercially recoverable due to one or more contingencies. Contingencies are conditions that must be satisfied for a portion of contingent resources to be classified as reserves that are: (a) specific to the project being evaluated; and (b) expected to be resolved within a reasonable timeframe. Contingencies may include factors such as economic, legal, environmental, political and regulatory matters or a lack of markets. It is also appropriate to classify as contingent resources the estimated discovered recoverable quantities associated with a project in the early evaluation stage. There is no certainty that it will be commercially viable to produce any portion of the contingent resources or that Blackbird will produce any portion of the volumes currently classified as contingent resources. The estimates of contingent resources involve implied assessment, based on certain estimates and assumptions, that the resources described exists in the quantities predicted or estimated, as at a given date, and that the resources can be profitably produced in the future. The risked net present value of the future net revenue from the contingent resources does not represent the fair market value of the contingent resources. Actual contingent resources (and any volumes that may be reclassified as reserves) and future production therefrom may be greater than or less than the estimates provided herein. Developed producing reserves are those gross reserves that are expected to be recovered from completion intervals open at the time of the estimate. These reserves may be currently producing or, if shut in, they must have previously been on production, and the date of resumption of production must be known with reasonable certainty. Developed non-producing reserves are those reserves that either have not been on production, or have previously been on production, but are shut in, and the date of resumption of production is unknown. Developed reserves are those gross reserves that are expected to be recovered from existing wells and installed facilities or, if facilities have not been installed, that would involve a low expenditure (for example, when compared to the cost of drilling a well) to put the reserves on production. The developed category may be subdivided into producing and non-producing. Gross means (i) in relation to the Company's interest in production or reserves, its "company gross reserves", which are the Company's working interest (operating or non-operating) share before deduction of royalties and without including any royalty interests of the Company; and (ii) in relation to wells, the total number of wells in which the Company has an interest. Net means, in relation to the Company's interest in wells or lands, the number of wells obtained by aggregating the Company's working interest in each of its gross wells. Probable reserves are those additional gross reserves that are less certain to be recovered than proved reserves. It is equally likely that the actual remaining quantities recovered will be greater or less than the sum of the estimated proved plus probable reserves. Proved reserves are those gross reserves that can be estimated with a high degree of certainty to be recoverable. It is likely that the actual remaining quantities recovered will exceed the estimated proved reserves. Reserves are estimated remaining quantities of oil and natural gas and related substances anticipated to be recoverable from known accumulations, as of a given date, based on: (i) analysis of drilling, geological, geophysical and engineering data; (ii) the use of established technology; and (iii) specified economic conditions, which are generally accepted as being reasonable. Reserves are classified according to the degree of certainty associated with the estimates. Undeveloped reserves are those reserves expected to be recovered from known accumulations where a significant expenditure (for example, when compared to the cost of drilling a well) is required to render them capable of production. They must fully meet the requirements of the reserves classification (proved, probable) to which they are assigned.